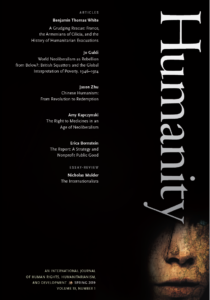 The new issue begins with two major pieces on the history of humanitarianism, including Daniel Cohen’s revelatory investigation of Christian humanitarianism in Palestine; turns to Vanessa Ogle’s insightful article on the “New International Economic Order,” which provides a foretaste of our special issue on the subject coming next spring; continues with David Shneer’s haunting commentary on Soviet photography of the Holocaust; and concludes with our usual array of reviews, notably Bronwyn Leebaw’s consideration of Ruti Teitel’s recent book. Justice, Charity, or Alibi? 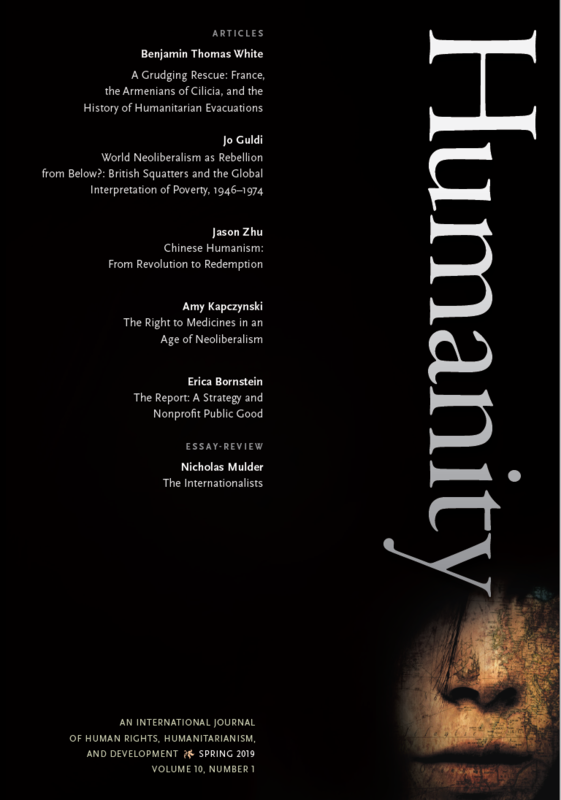 Humanitarianism, Human Rights, and "Humanity Law"